Bottom club Aston Villa were well beaten by Everton as home supporters walked out in protest at American owner Randy Lerner. Fans headed for the exits in the 74th minute - Villa were formed in 1874 - with their side trailing 3-0. Ramiro Funes Mori gave Everton the lead by meeting Kevin Mirallas' corner before Aaron Lennon's close-range finish doubled their lead. Romelu Lukaku made it 3-0 before Rudy Gestede headed a consolation for Villa. The result leaves the home side eight points from safety with 10 games left. Mathematically, Villa can still avoid a first relegation since 1987. Yet with five of their remaining 10 games against Manchester City (away), Tottenham (home), Chelsea (home), Manchester United (away) and Arsenal (away), they have their work cut out to avoid the drop. 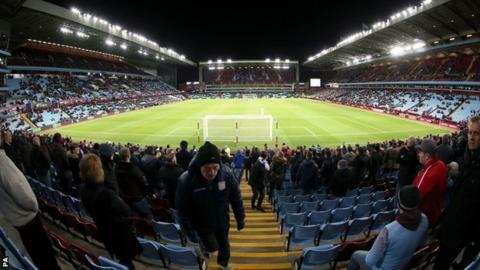 The mood inside Villa Park was ugly throughout, with fans in the sub-30,000 crowd making their feelings known towards the club's hierarchy. Those who joined the 74th-minute protest - which will be repeated at their next two home games - missed substitute Gestede's goal from a Jordan Veretout cross. However, it could not prevent Villa from a ninth defeat in 17 league games - and third in a row - under Remi Garde. "The mood is turning ugly. The crowd are chanting 'from European nights to relegation fights - we want Lerner out'. A few fans are pointing fingers at chief executive Tom Fox in the directors' box. "There are hundreds of fans streaming out of Villa Park. There are a lot of people who have paid a lot of money walking out. The Villa fans are voting with their feet. I haven't seen anything like this before at Villa. "I remember the demonstrations against Doug Ellis, but he must seem a great chairman in retrospect. This is the worst team I've seen in 41 years of reporting on Villa, simple as that." Can Martinez bring success to Everton? There is renewed pressure on Roberto Martinez following the multi-million pound investment in Everton by Iranian billionaire Farhad Moshiri. Yet if the Spaniard is feeling the heat, he did a great job disguising it, taking time to shake hands with Villa's mascot and sign autographs during the match. His side controlled the game from start to finish, racing into a 2-0 lead as Villa left Funes Mori in space to score before Lennon fired home after being teed up by the impressive Mirallas. Funes Mori turned provider as Lukaku's knee helped make it 3-0 and it could have been more - Bryan Oviedo had a shot cleared off the line. There will be much tougher tests for Martinez and Everton but, having climbed above neighbours Liverpool into 10th spot, this was a highly satisfactory night for them. Aston Villa boss Remi Garde: "When you prepare a plan and so early in the game you have to change it, it's very difficult. We were too fragile, we didn't take the advantage of playing at home. "The positive sign is that we never gave up and we reduced the score. But it's difficult to keep a positive mood when you miss chances like we missed today." Everton manager Roberto Martinez: "We managed the game well - it's always difficult when you're away from home to get a real good composure but we had that. It's a performance that won't get the credit it deserves - Aston Villa had a lot of fight. "I feel that the squad is in a very good moment - we've been very consistent the last six games. We're enjoying our football and playing with a lot of confidence." No Premier League team has survived having taken 16 points or fewer from their opening 28 games. Aston Villa have lost three successive Premier League games for the first time since November. Everton are unbeaten in their past eight Premier League away games (W3 D5). Lukaku has scored 17 Premier League goals this season, equalling his best return - in 2012-13. Mirallas provided his first Premier League assist in 454 days. Lennon has scored more Premier League goals this season (four) than he did in his previous two campaigns combined (three). It does not get any easier for Villa. They face teams chasing the title in both of their next two games - visiting Manchester City on Saturday (15:00 GMT) before hosting Tottenham on 13 March. Everton will try to make it four wins in five Premier League games when they host West Ham on Saturday (15:00 GMT). Match ends, Aston Villa 1, Everton 3. Second Half ends, Aston Villa 1, Everton 3. Attempt saved. Ramiro Funes Mori (Everton) left footed shot from very close range is saved in the centre of the goal. Assisted by Romelu Lukaku. Corner, Everton. Conceded by Aly Cissokho. Attempt blocked. James McCarthy (Everton) left footed shot from outside the box is blocked. Assisted by Ross Barkley. Corner, Everton. Conceded by Ciaran Clark. Attempt missed. Alan Hutton (Aston Villa) header from the centre of the box misses to the right. Assisted by Jordan Veretout with a cross following a corner. Corner, Aston Villa. Conceded by Aaron Lennon. Attempt saved. Jordan Ayew (Aston Villa) right footed shot from outside the box is saved in the centre of the goal. Assisted by Rudy Gestede with a headed pass. Corner, Everton. Conceded by Alan Hutton. Attempt blocked. Kevin Mirallas (Everton) right footed shot from the left side of the box is blocked. Assisted by Romelu Lukaku. Corner, Aston Villa. Conceded by Ramiro Funes Mori. Attempt blocked. Rudy Gestede (Aston Villa) right footed shot from the right side of the box is blocked. Assisted by Idrissa Gueye. Attempt blocked. Leandro Bacuna (Aston Villa) left footed shot from outside the box is blocked. Substitution, Everton. Leighton Baines replaces Bryan Oviedo because of an injury. Leandro Bacuna (Aston Villa) wins a free kick on the left wing. Goal! Aston Villa 1, Everton 3. Rudy Gestede (Aston Villa) header from the centre of the box to the top right corner. Assisted by Jordan Veretout with a cross. Delay in match Bryan Oviedo (Everton) because of an injury. Substitution, Everton. John Stones replaces Seamus Coleman. Attempt missed. Idrissa Gueye (Aston Villa) left footed shot from outside the box is high and wide to the left following a corner. Corner, Aston Villa. Conceded by Bryan Oviedo. Substitution, Aston Villa. Jordan Veretout replaces Ashley Westwood because of an injury. Attempt missed. Romelu Lukaku (Everton) left footed shot from the left side of the six yard box is too high. Assisted by Phil Jagielka with a headed pass following a corner. Substitution, Aston Villa. Rudy Gestede replaces Gabriel Agbonlahor. Delay in match Micah Richards (Aston Villa) because of an injury. Attempt missed. Ashley Westwood (Aston Villa) right footed shot from the centre of the box is close, but misses to the left following a corner. Corner, Aston Villa. Conceded by Phil Jagielka. Attempt blocked. Ashley Westwood (Aston Villa) right footed shot from the centre of the box is blocked. Assisted by Micah Richards. Goal! Aston Villa 0, Everton 3. Romelu Lukaku (Everton) right footed shot from very close range to the high centre of the goal. Assisted by Ramiro Funes Mori with a cross following a corner. Attempt saved. Romelu Lukaku (Everton) header from the centre of the box is saved in the bottom left corner. Assisted by Aaron Lennon with a cross.